Kyle Jackson, a senior in chemical and biological engineering, has been named a recipient of the Doug Grunewald Peer Mentor Scholarship. 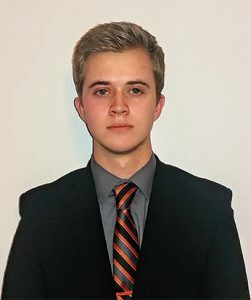 He is one of four Iowa State University undergraduates to receive the honor for the spring 2019 semester. The needs-based scholarship is for undergraduate students who have been hired to work as Learning Community Peer Mentors during the term of the award. The scholarship was established in honor of Dr. Doug Gruenewald, the former director of the Learning Communities program who served from 1995 – 2016. The scholarship provides additional financial support for student leaders dedicated to helping other students to persist and succeed academically at Iowa State University. The Department of Chemical and Biological Engineering maintains an active peer mentor program, with 16 working in the role with this semester’s first-year student learning community. Department peer mentors also work with transfer students and international students. Contributions to the Grunewald Peer Mentor Scholarship can be made here.